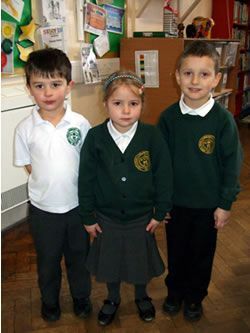 We recommend all children wear school uniform as this helps children develop a sense of belonging. Initially Yours: you may buy online at www.initiallyyours.co.uk. Orders delivered to your home (P&P £4.50) or can be collected from their shop free of charge. Or buy directly from their shop at: Unit A4, Badminton Centre, Station Road, Yate, BS37 5HT. Tesco: buy online at http://www.clothingattesco.com. Free delivery and Clubcard points for you and 5% commission for the school. Samples available for inspection at the school office. Tesco does not yet offer the school hoodies. Sensible school shoes should be worn, no high heels or trainers and no open-toed sandals. Nail varnish and make-up are not permitted. Jewellery should not be worn to school, except stud earrings which your child should be able to remove themselves for PE. Please ensure uniform is clearly marked with your child’s name. Hair should be appropriate for school – no extravagant hair clips/scrunchies. Lines and logos should not be shaved into your child’s hair. We recommend all children have a book bag for their reading book and homework. Please ensure your child’s name is clearly written on the bag to ensure that it can be easily identified. Please check your child’s bag for letters each day. Book bags with the school logo are also available.